United Way of Salt Lake’s Promise Partnership received national recognition for its work improving student outcomes in the Salt Lake City region from the nonprofit StriveTogether. For nearly a decade, UWSL has been working to ensure that every child along the Wasatch Front can succeed every step of the way, from cradle to career. Specific goals include improving access to early childhood education, grade-level reading and math proficiency, high school graduation and college access and completion. In addition, UWSL works to ensure that students’ and families’ basic needs, health, and financial stability needs are met. United Way of Salt Lake’s work is place-based in schools and in communities to ensure that families are connected to the right support and teachers, and communities are also supported. Proof Point is a designation given by StriveTogether, to those communities that are making significant progress toward improved systems-level results. Our Promise Partnership is one of only 11 StriveTogether communities to receive this status out of the nearly 70 in StriveTogether’s national network. What does proof point mean for our work? The proof point designation means that our work in schools, communities, and with community leaders is changing Salt Lake City for the better. We are seeing measurable progress toward ensuring every child has every chance to succeed in school and in life, no matter their race, background or circumstance. Our work with cross-sector partners has allowed for changes in schools and communities, but also in the systems and policies that affect them. At UWSL, we work with hundreds of partners to create lasting social change. We work in schools to improve education outcomes and provide students and families with the extra support they need. 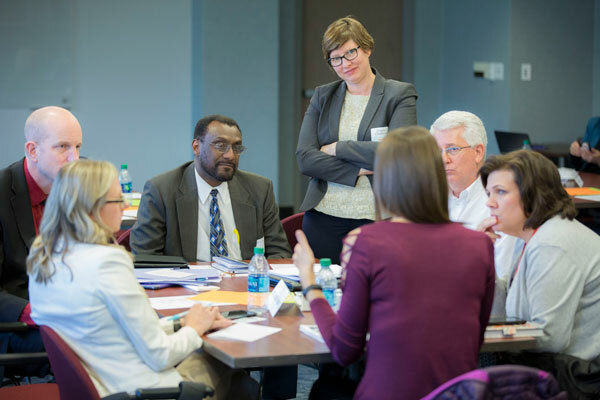 We collaborate with local community leaders to identify gaps in systems that hold families back. And we advocate for policies that give future generations their best chance at a successful life. To learn more about our community partnerships and how we are getting our work done, visit uw.org/goals.